Complete and modern apartments in Madrid. The G3 GaleÃ³n Hotel is a very comfortable apart hotel, offering to its clients, magnificent apartments in order to enjoy the complete freedom and the most modern equipments and services. It is located in the North of Madrid, at just 20 minutes from the Barajas airport and Madrid Trade Fair, and very well connected by bus and subway to any part of the city. The G3 GaleÃ³n Hotel offers 38 outer apartments composed by an independent Bedroom, integrated kitchen and Bathroom. 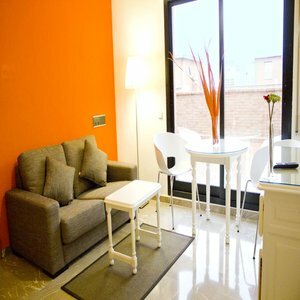 These apartments are carefully decorated and equipped in order to offer the maximum contentment and rest of its guests. Moreover, the G3 GaleÃ³n Hotel also disposes of large and full lounges to hold reunions, as well as car park and Wi-Fi connection everywhere in the hotel. Due to its location, comfort and space, it represents a great choice to spend there your business trips, holidays or to stay there for a long time.